Welcome and a big warm “Thank You” for visiting our website. What a blessing it is to serve our patients! Thank you for the opportunity to enrich your life through a beautiful smile. Our service goes well beyond the standard of care. We refuse to subject our patients to the “Disease – Repair – Repeat” process of standard dentistry. There is a better way! I am excited you have chosen a lifetime of health and beauty in your smile. Dr. Scott A. Logan, a Master of the Academy of General Dentistry considers it an honor to enrich the lives of his patients by ensuring the beauty of their smile and the quality of their oral and overall health. His comprehensive, preventive approach to care goes well beyond the “Disease - Repair - Repeat” process that is common in dentistry. At their dental practice in Huntsville, TX Dr. Logan and his team will help you have sustainable health and beauty in your smile through personalized, unhurried attention to detail in a relaxed and comfortable environment. Scott A. Logan, DDS, MAGD has advanced training in a myriad of dental procedures to help you achieve the health and beauty of the smile you desire. Dr. Logan will work with you to develop a treatment plan that employs the most effective and least invasive techniques available to modern dentistry. Thanks to the advanced techniques and technologies he employs, some procedures, such as crowns and veneers, can be completed in as little as one visit utilizing their advanced CEREC technology. A perfectly balanced bite is available with the computerized Tekscan bite analysis system. Dr. Scott A. Logan has extensive experience in caring for the debilitated smile. He has restored confidence, beauty, function, and health for patients with a variety of concerns. Whether you need a full mouth rehabilitation, exquisite dentures or preventive therapy, you can rest assured Dr. Logan will employ the most advanced, effective techniques in restoring your oral health. He has found fine dentistry is available for all patients. Quality of care will remain constant while you determine a time frame for completing therapy that meets your specific needs. As a member of several prestigious organizations including the American Academy of Oral Systemic Health, the Academy of Cosmetic Dentistry and the Academy of General Dentistry, Dr. Logan orients his practice around sustainable, preventive measures that aim to maintain a patient’s oral health before concerns arise. 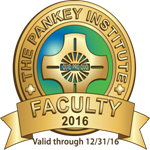 He is part of the Visiting Faculty at the prestigious LD Pankey Institute where he trains dentists from all over the world in advanced dental techniques. His in-depth, proactive approach to dental care begins with a thorough examination. During the initial consultation, Dr. Logan will do an in-depth analysis of your oral health and how it integrates with your overall medical (systemic) health. He combines over thirty years of training and advanced digital diagnostic technology to maintain the beauty and health of your smile for a lifetime. Contact Dr. Scott A. Logan your Huntsville area general, restorative and cosmetic dentist to schedule an appointment today at our Huntsville office, and prepare for the difference a beautiful smile will make in your life.